Aaron has danced all the way around and then right to the core of that phenomenon we know as “liveblogging”: Area Code of the Beast. Most importantly, he reminds me of where to follow today’s matches while hard at work at my new office. Not exactly what he meant, I don’t think! In the land of the sour dough baguette, the burrito is king. Flickr has been acquired by Yahoo. I bet a lot of people are going to be negative about this, but not me. I prefer a wait and see approach. But I will say that I bet Aaron never imagined he’d work for Yahoo! new site from Cam Barrett and Joe Stump: TodaysPapers.com. 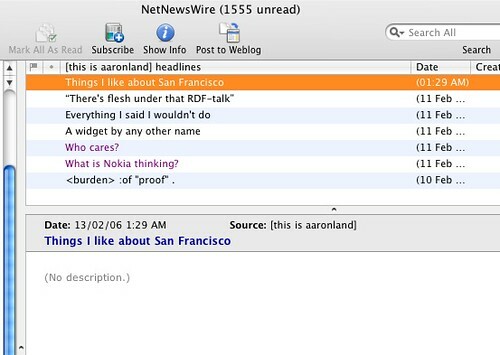 Adding community features to news stories from all over the web. I wonder if Aaron’s NYTimes stuff could add something to this? Trouble is Aaron has been so very coy about his /knows/ stuff that I’m not sure I follow what it is.